According to new data from Vindico's Adtricity rankings, just 34% of online video ad impressions received a grade of "A or B," equating to TV quality. The definition of "A-B" is a high-quality video ad environment, imitating a TV-like experience, with ads front and center, in a large player and frequently user-initiated. Another 22% of video ad impressions received a "C," which is typically an in-banner placement that is viewable on the page. Finally, 44% received a "D-F" which includes video ads that are below the fold, are near inappropriate content and/or suffer from fraudulent practices. The data is part of Vindico's newly-released 2013 annual report. Major media sites had the highest level of video ad quality, with 96% in the "A-B" category. 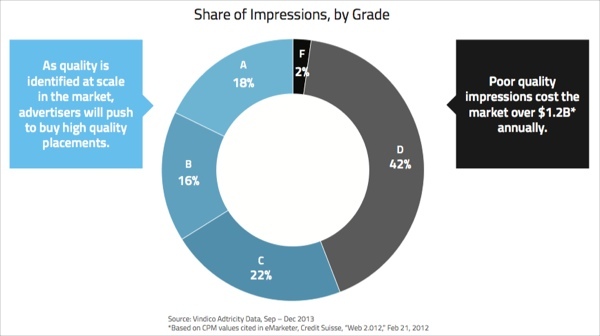 Well behind were Internet brands with 24% "A-B" and finally networks/exchanges at 22%. Vindico noted that the biggest single influencer of quality is placement. Vindico also found that just 44% of video ad impressions were viewable, as defined by 50% of the ad being in view for at least 1 second. Once again major media sites performed the best, with 78% of ads viewable, followed by both Internet brands and networks/exchanges at 37%. Validating how important viewability is to ROI, 81% of viewable ad impressions were seen through to completion, with major media sites leading with 89%. Vindico notes that viewability is just one component to measuring video ad quality, with others including content quality, execution and traffic & domain trust and quality. Adtricity assigns letter grades across all of these components. Ad quality is critical to online video providers who are making the case to ad buyers that their video should thought of as comparable to TV networks - a key message during these NewFronts weeks. Survey data earlier this week from IAB indicated that buyers would allocate their ad spending basically at parity between TV and online video for their most important campaigns. The report also includes a slew of performance benchmarks. It is available for complimentary download here.